* Transcends shortcomings of Boolean logic. * Presents theoritical foundations, architecture and analysis of clockless (asynchronous) circuit design. * Contains examples and exercises making it ideal for those studying the area. KARL M. FANT is President of Theseus Research, Inc. After serving as a Research Fellow at Honeywell, he co-founded Theseus Research and then Theseus Logic, which is now commercializing NULL Convention LogicTM. He holds twenty-nine patents and has published numerous papers. 1.1 Mathematicianless Enlivenment of Logic Expression. 1.3 Supplementing the Expressivity of Boolean Logic. 1.4 Defining a Sufficiently Expressive Logic. 1.5 The Logically Determined System. 1.6 Trusting the Logic: A Methodology of Logical Confidence. 2. A Sufficiently Expressive Logic. 2.1 Searching for a New Logic. 2.2 Deriving a 3 Value Logic. 2.3 Deriving a 2 Value Logic. 3. 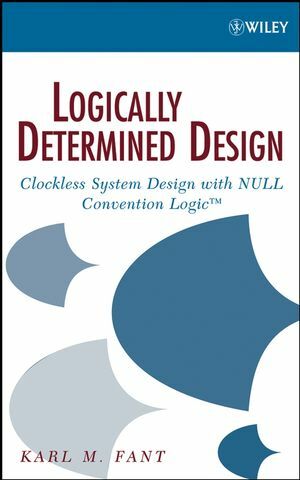 The Structure of Logically Determined Systems. 3.3 Control Variables and Wavefront Steering. 3.4 The Logically Determined System. 4.2 The Library of 2NCL Operators. 4.4 Example 1: Binary Plus Trinary to Quaternary Adder. 4.5 Example 2: Logic Unit. 4.6 Example 3: Minterm Construction. 4.7 Example 4: A Binary Clipper. 4.8 Example 5: A Code Detector. 4.11 Directly Mapping Boolean Combinational Expressions. 5.2 Partitioning the Data Path. 5.3 Two-dimensional Pipelining: Orthogonal Pipelining Across a Data Path. 6.3 The Consume/Produce Register Structure. 6.9 Wrapper for Standard Memory Modules. 7.1 Basic State Machine Structure. 8.2 A Fan-out Steering Tree. 8.3 Fan-in Steering Trees Do Not Work. 10. The Shadow Model of Pipeline Behavior. 10.2 The Pipeline Simulation Model. 10.5 The Value of the Shadow Model. 11.2 Buffering for Constant Rate Throughput. 13.2 Example 1: The Basics of a Two-pipeline Structure. 13.3 Example 2: A Wavefront Delay Structure. 13.4 Example 3: Reducing the Period of the Slowest Cycle. 14.1 Linear Feedback Shift Register Example. 14.3 The LFSR with a Slow Cycle. Appendix A: Logically Determined Wavefront Flow. A.4 Extended Simulation of Wavefront Flow. A.5 Wavefront and Bubble Behavior in a System. Appendix B: Playing with 2NCL. B.1 The SR Flip-flop Implementations.